The Clean Social Circles set consists of 8 amazing icons built in PSD and CSS formats. The icons are eye-catchy and highly effective in drawing users’ attention. You can select any of the social media icons from the set to link your website to them. As a designer, you need to look into several aspects of designing a website so that it becomes a hit in the internet market and gains traction. For this, you have to adopt different practices and watch the use of every user interface element in web design from close quarters. For instance, you must have noticed that nowadays people like to bookmark and share their favorite content on the much-talked about social networking platforms. It’s in vogue. From this, it is easy to gather that your website needs to have a feature which can make bookmarking and sharing easy for your users. One of the best ways to implement this feature in your design is that add suitable social media icons. Icons can easily attract the attention of your users and can be effectively used to link to the top social media sites. Why Use Clean Social Circles? You can use these icons to enjoy several benefits, such as to increase traffic and user engagement on the site and to enhance the look of your web design. Other than benefits, the set is also worth trying because of its exciting features. The features are as stated below. 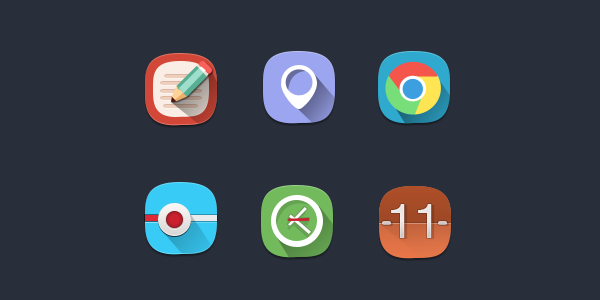 All the icons in this set are resizable and fully layered. These are formatted in PSD and CSS. The icons are designed in beautiful pastel colors. You can download these icons free from the internet.